You have until 11am PT to snag it from the blog! Code is valid till 11:00 AM PST (2:00 PM EST). BTW, since April 18/10 I've already earned almost enough for $2,100.00 in Amazon gift cards! How much have you earned? 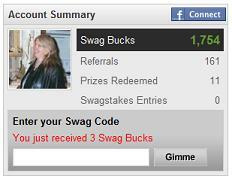 Come share in the Frugal Freebies discussion forum! Are you doing your 5 SBs dailies? Earn 2 SBs for clicking thru the "View Our No Obligation Offers And WIN Swag Bucks", I just read each offer carefully, clicked on "Skip" or "No" or "See Next Offer" for anything I wasn't interested in, and you can do this every single day to earn SBs!